Click here to visit the Photo Gallery from this event! 22-24 on the trails in Tellico. Calendars marked and reservations made, a Toyota ride was on. We rolled into Crawford’s Camp outside of Murphy, NC late Thursday night to find that there were already several Toyota’s scattered around, with more coming in well into the night. After setting up camp we got to know our campsite neighbors, chatted a while, then turned in anticipating hitting the trails Friday morning. Friday morning we awoke to a beautiful day, something we had worried about with the projected chance of rain you get used to when you spend a few days at Tellico. Even though there were no official rides planned for Friday, we all knew it would be a good chance to see the trails with a lot less traffic than the weekend would bring. Just as we are gathering at the pavilion to see who wanted to hit the trails it started to rain. Lucky for us, it turned out to be just a twenty-minute mountain shower that actually served to cool things down a bit and keep the dust to a minimum. With drivers gathered around by mid-morning, Steve Crawford introduced us to some local wheelers who had graciously agreed to lead us around for the weekend. 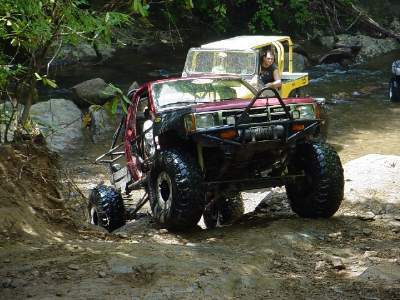 Their hospitality lets us overlook the fact that they chose to drive something other than Toyota’s on the trail We gathered a group of 11 rigs and set out for the trails. After some road driving we pulled up to the Tellico ORV pay station. 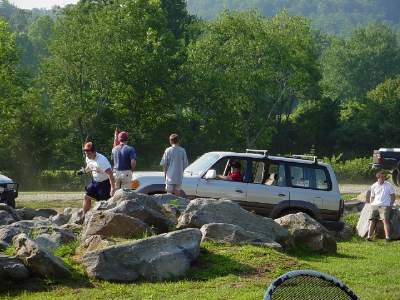 We all took the time to air down, and be sure to pay the trail use fees that go directly to keeping the trails in Tellico open for all of us to enjoy. With everyone paid up we continued down Trail 1 to the Tennessee side then started back in across the river crossing on Trail 5. From there it was a fairly uneventful ride over to Fain’s Ford, where everyone took a few minutes to play on the ledges coming up out of the river. After a quick lunch break, we continued on to Slickrock off of Trail 9. The relatively dry conditions let everyone climb to the top without breakage or pulling cable, and Jon took the All Pro truggy up the right side while most everyone else snaked their way around to the left. 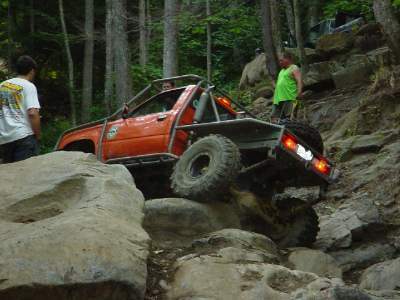 Surprisingly enough, it was the last obstacle above Slickrock that gave our group the most trouble, with one of our trail leaders busting a front driveshaft joint, several having to winch, and others able to work the right line to make the rest of us look bad. With that obstacle behind us and repairs completed, we made our way down Trail 8 back towards the state line campground where a few of us decided there was still time to tackle the infamous lower section of Trail 2. We made quick work of the bottom rock garden, and everyone lined up for the rough final climb. Yet again, we had a variety of results as everyone tried to make it through. A few of us tried to work the ledge any way we could, only to end up needing to pull cable. We had some breakage as well, with one truck snapping an aftermarket inner shaft and taking out a Detroit locker in the process and another spinning the splines in his rear driveshaft. 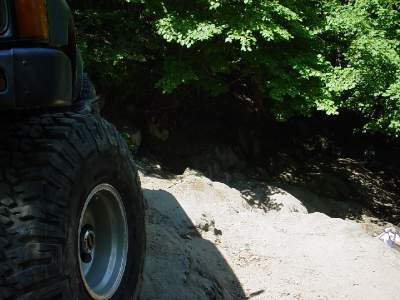 The two damaged trucks made their way back out the gravel access road while the rest of us continued on to finish out the upper part of Trail 2 to end our day on the trails. It was a long day, not rolling into camp until well after 8:30 pm, but we were able to cover a lot of ground with a good group of rigs and drivers. Back at camp even more people had arrived and we were all looking forward to another day of riding on Saturday. Saturday morning started the official activities of the All Pro customer appreciation Jamboree. With everyone gathered around under the pavilion for the 8 am driver’s meeting, we split off into several groups to tackle trails for the day. Several of the same guys from Friday’s ride got together again to hit a few more trails, as well as a few who had just arrived the night before. It was not long before we were back on the trail. This time we turned off of Trail 1 to Trail 4, then headed up Trail 11 to tackle Guardrail and eventually Helicopter Pad. Coming up to Guardrail, we found ourselves behind a group already giving it a shot. We got to watch a variety of Toyota and other vehicles try a variety of different lines up the Guardrail obstacle. Two propane powered Toyota buggies put on quite a show climbing the far left line by the old tree, shooting up and over both sets of ledges to the top. Once they were through it was our group’s turn to give it a shot. Like the previous group, we got to witness a wide variety of lines and driving styles as everyone tried to make their way up the rock. 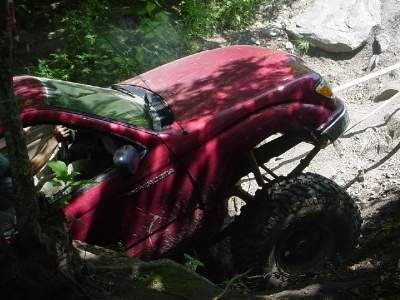 One Jeep in our group took a tumble on it’s side at the bottom, but it was nothing a handful of guys couldn’t handle and get him back rubber side down and ready to give it another shot. Another 4Runner shot up the right side, only to bounce sideways and end up parallel parked at the top ledge, with both driver’s side tires mere inches from what would have been a nasty roll into the cable safety net below. A quick tug with the winch to get him headed the right direction and we were all breathing a little easier. 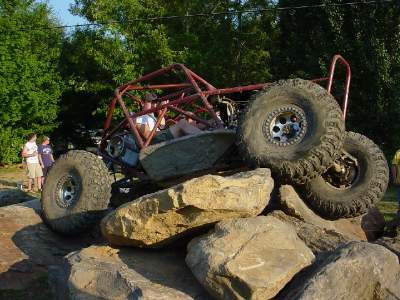 It was also here on Guardrail that it became obvious that the Krawler tires were really hooking up on the rocks at Tellico, a trend that would be confirmed throughout the weekend. Next we moved on to Helicopter Pad, to see how our group would manage there. The more adventurous drivers made a go at the rock face to the right, with Jon again shooting straight up and over in his truggy. Some of us had to work further over to the left, and fight to get the traction needed to make it to the top. 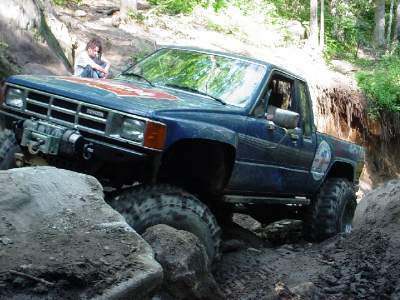 One Tacoma running a Dana 44 solid front axle won the award for spectacular breakage of the day, by snapping his front pinion in half sending the driveshaft and yoke flying violently around after a loud bang let us all know he was in trouble. He was winched to the top, and then led back down the trail towards camp by our trail leader while the rest of us took a lunch break. With our trail leader back from leading the damaged truck out to Trail 1, we moved on to work our way down and out trail 12 known as Schoolbus. We all worked our way slowly down the steep trail, trying to keep our rigs out of the banks, roots, rocks, and stumps that seemed to be reaching out from every side. Dropping off some of the steep ledges made for some interesting maneuvering, but everyone made it down to trail 3 without major damage. From there it was a short drive out to Trail 4, then on to Trail 1 and back to camp. We ended our day a little early, wanting to get back to camp with time to clean up before the catered meal was to start at 6 pm. 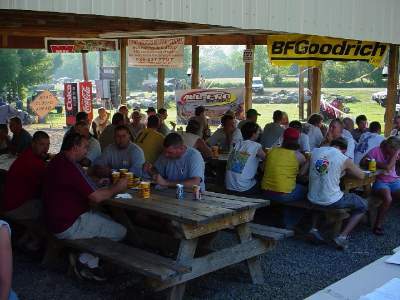 All Pro had arranged for Buddy’s BBQ out of Knoxville, TN to feed us all, and they did it in a superb way – with great food and plenty of it to go around. After the meal, Jon thanked us all for supporting All Pro over the years, and for attending the event that weekend in Tellico. 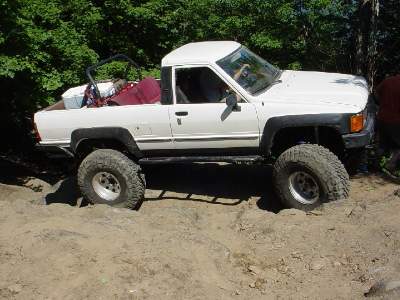 He followed that up with a raffle, which included a pair of Bilstein 5150 external reservoir shocks, crossover steering kit, and All Pro’s new triple X-member setup with the integrated emergency brake kit. 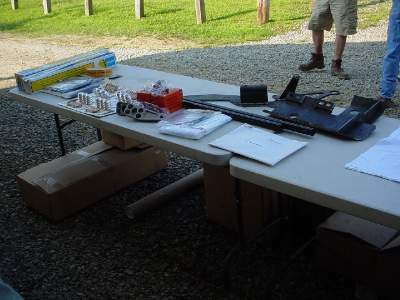 There were several smiling faces as attendees walked away with great new parts for their rigs. We wrapped up the day with a few people making their way through the competition rock course right in the middle of Crawford’s campground, with a few of them managing to snap a birfield or two in the process. Sunday morning found most of us packing up camp, saying our goodbyes to new friends and old ones, with many making arrangements to do this again as soon as possible. There were vehicles in attendance from Florida, Georgia, Alabama, Tennessee, Kentucky, South Carolina, North Carolina, Virginia, and more. It was a great weekend of riding, with everyone I talked to having an awesome time. I would like to offer a special thanks to Steve Crawford for hosting us at a campground that is tailor made to the off road crowd, and a few local guys offering up their time to lead us around on the trails both Friday and Saturday (Jay, George, Jody, and the rest of you guys). Most importantly a big thank you to Jon Bundrant and All Pro Off Road, for putting out the kinds of products that make it possible for a large group of Toyota rigs to run the hardest stuff Tellico has to offer and leave ready for more. 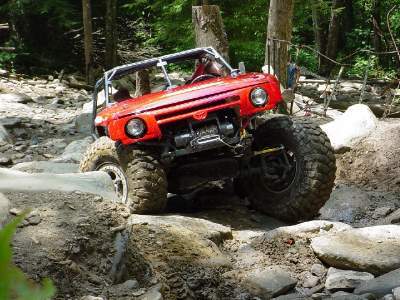 Jon – we hope you had a great time wheeling with us, and hope you come back again soon!